Is this the future of blenders? If you read the user forums on juicing or blending websites, you’ll often see people arguing about the benefits of one versus the other. Blending advocates say that juicing removes valuable fiber, while juicing advocates say that the high speed of blenders destroys most of the nutrition through oxidation. The fact is, both juicing and blending are beneficial. By removing the pulp, juicing provides a concentrated boost of nutrition that is rapidly digested by the body. On the other hand, blending keeps all the fibers of the produce, which can be beneficial to the digestive system and also creates a feeling of fullness. Oxidation begins the moment any fruit or vegetable is exposed to air. This was a problem with juicers, which normally use a high-speed centrifugal process to make juice. The introduction of low speed masticating juicers in recent years solved that problem. These juicers operate at very low rpm, which minimizes oxidation and produces a much higher-quality juice. Unfortunately, slow speeds are not possible with blenders. Blenders need to operate at high rpms to be able to process ingredients into a smooth result. There’s simply no way around that. And those high speeds expose produce to heat and oxidation. Some clever engineers had an idea. If oxidation takes place as a result of materials coming into contact with air at high speeds, what if the air was removed? In retrospect, it seems so simple. 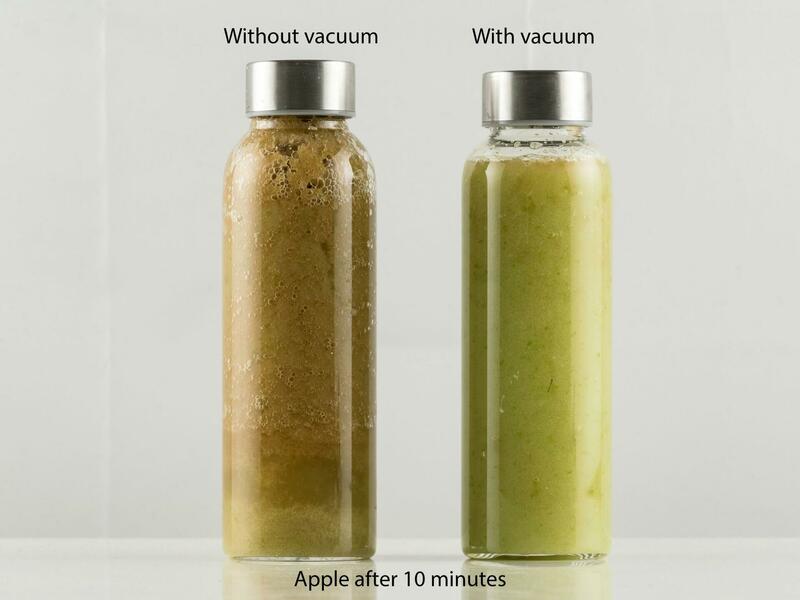 So they designed a blender that uses a built-in vacuum to remove the air before blending. This has two important benefits. First, the obvious benefit is that contact with oxygen is minimized. Secondly, the vacuum causes plant fibers to expand, allowing more efficient and smooth processing by the blades. This leads to smoothies that are brighter in color, taste sweeter, have a smoother consistency, and stay fresh longer. The final result is the new Vidia blender, which is the first of its kind. Look in our eshop for more information on the Vidia blender. And check our YouTube channel for tests and recipes.